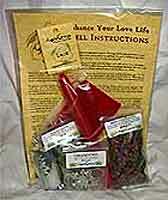 Easy to use, this powerful do it yourself Voodoo Spell is designed to bring the one you desire into your life! Voodoo Spell written for candle and charm magic, this kit contains a sigil bearing ritual candle charged to aid in drawing your desireed one to you. Two different herbal spell mixes, charcoal, two spell pouches, a Ganesh (the Hindu god of happiness, and removal of obstacles) pendant, and detailed instructions on how to perform the ritual and use the included tools. Wish magick is powerful, mysterious, and often unpredictable. The simple truth is that sometimes even though we think we may be aware of what we desire, sometimes our unconscious is better attuned to the desires that influence us. The Secret Desires Fulfilled boxed Do it Yourself Voodoo Spell kit has been created to help bring that which you desire, mind, body and spirit, into your life to satiate your secret yearning. Just be ready for the unexpected! Easy to use, this powerful ritual kit is designed to bring passion and fire into your life, stirring a new vigor into your love life. With a non-denominational ritual written expressly for the magical practices of candle and charm magic. 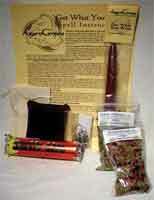 This Do it Yourself Voodoo Spell kit contains a sigil bearing ritual candle charged to instill passion, two different herbal spell mixes, charcoal, two spell pouches, a Lancelot crest designed to invoke the passions of the fabled Knight and Guinevere, and detailed instructions on how to perform the ritual and use the included tools. It is believed that every soul has its partner: another soul that balances us in life, making us feel complete and at peace. Some people spend a lifetime searching for this partner, looking for a person to help them feel complete. 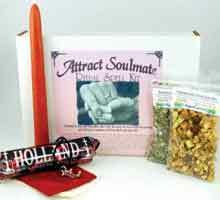 The Attract Soul mate boxed ritual kit has been created specifically to help you find your other half, bringing this peace and comfort into your life. Visions can help us come to understand ourselves, our life paths, and the answers to the mysteries that surround us. 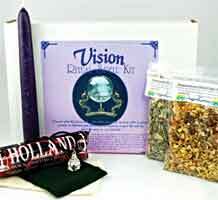 The Vision boxed ritual kit has all that you need to work a ritual intended to help you experience the visions that can help you grow, evolve, and prosper within and without. Easy to use, this powerful ritual kit is designed to bring the love you yearn for into your life, providing everything you need to attract the affection you desire. 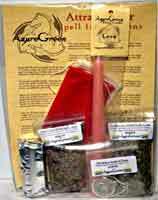 With a non-denominational spell written expressly for the magical practices of candle and charm magic, this kit contains a sigil bearing ritual candle charged to attract love, two different herbal spell mixes, charcoal, two spell pouches, a magical seal crafted to draw love into your life, and detailed instructions on how to perform the ritual and use the included tools. Whether you're fighting an uphill battle in the legal systems or looking to have a little extra help tipping things in your favor. 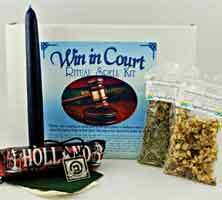 Our Win in Court boxed ritual kit is an easy to use spell kit. Sometimes the baggage we keep with us, both consciously and unconsciously can keep us from moving on and growing in life. Whether it is something we have experienced, or something that has been inflicted upon us, it is difficult to simply let go. The Releasing Boxed Ritual Kit provides the tools you need to work a ritual intended to help you let go and step forward into the next phase of life. 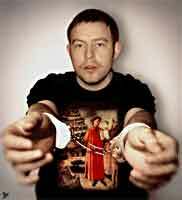 A love/Controlling powder that you sprinkle where the target will come in contact with it to put them under your Spell. NOTE: This is a Spell placed on a powder that we make to order, during a Waxing moon. If for a specific target please provide their picture and full name. WARNING *NOT FOR HUMAN CONSUMPTION* Only to be sprinkled on areas target will touch, do not place in food or beverage. Please Add $10 (usd) Shipping for all PACKAGE ORDERS (international & domestic) - ....Thank You! Do it yourself Voodoo Spells, Continued - For those new to the art of spell casting, a properly prepared altar is the first big hurdle to master. A proper altar can be as simple or grand as you want to make it. First choose where your altar is going to be. Is it going to be hidden and kept private? Is it going to be a grand piece of your decor? It can be as small and simple as an area on the top of a dresser or it can be on it's own furniture. Start with the basics-candles, flowers, drink offering. Our do it yourself spells contain many of the non perishable components.. Have your appropriate color represented. You can start out with it simple like this-or you can begin with a bang-with altar decorations. You can always start simple and gradually add to it. The altar always wants to reflect the spirit or deity that it represents-you want them to feel comfortable with the altar and be happy to help you. It should be created out of love and respect. Altars in general will continue to grow-especially in the case of Voodoo altars. In addition to the prepackaged components of a do it yourself Voodoo spell, use your imagination and creativity - intent is everything. Because offerings and gifts are given to the Lwa on a continual basis, the altar and altar area is always growing. So even if you start off small, plan on it expanding over time. If amount of space is an issue, always remember you can be creative with shelving and such. Not only will it add to the available space that you can use but will also add to the "look". After you have chosen a Lwa whom you want to serve, you will want to decide how involved this is going to be. Is this going to be something very simple and basic. Serving the Lwa can be as simple as lighting candles or can be done with an altar with regular offerings. If you are interested in do it yourself Voodoo spells (more than a passing fancy), then my first suggestion is to do a bit of research about the different Voodoo Lwas. There are literally thousands of them, but concentrate on the main, more well known ones, this will make a good start. If you choose to work on spellcasting in Voodoo, you can ask for the Lwa to help in bringing positive results and adding power to your spellcasting. You can also just ask the Lwa to bless your life and help with certain aspects of your life without actually casting magic. Either way, teh Lwas can be very generous and helpful when they are served with honor and respect.